After 25 km of strenuous exit from the newly emerging Yangzhou we are finally on the road that leads direction north along the Grand Canal. And what a road it is! – as if designed for bikers: new, empty and quiet, shaded by trees. The traffic is accommodated by the new highway to the east, and on our way we meet only occasional motorbikers or single cars. The road is built on the embankment, and from our elevated position we have a good view of the canal on our left, and the lower lying villages on the right. The Grand Canal, stretching between Beijing and Hangzhou, connects the Yellow River with the Yangzi in southern China. Nearly 1800 km in length, it is the longest man-made canal in the world. Some parts of it date back to the 5th century BC, but the existing sections were finally combined in the 7th century, during the Sui dynasty. For more than a millennium, from Tang to Qing, the Canal was the main economic and commercial artery between Northern and Southern China that could bring fortune and prosperity to the cities on its route, like Yangzhou. In 1855 the Yellow River, however, flooded and changed its course in Shandong. The northern and southern sections of the Canal were thus severed, and the Canal fell in decline. The construction of railways in the early twentieth century further diminished its significance. The section of the Canal between the cities of Yangzhou and Huai’an, along which we will be biking for three days, is one of the oldest parts of the Grand Canal, connecting Yangzi and River Huai. It was rebuilt in the 1950ies and then in the 80ies and is fairly straight. Nowadays it is used for commercial shipping only. While in the past the barges were laden with grain and salt, nowadays they transport heavy loads like coal, sand, gravel and bricks. Sarah is fascinated by the that the big river she sees is man-made: ”How can one built a river?” “Simply by digging earth, like digging sand in the playground?“ “How does one make a river flow?” “How does one bring the water into the river?” Aren’t there any handbooks for parents with handy answers to curious 6-years olds? It is already late afternoon as we arrive in the town of Gaoyou. Similarly to the other towns along this stretch of the canal, it once has been an important commercial and transportation hub, but lost its significance in the late 19th century. As we bike towards the centre of town we reach a broad square with a Buddhist pagoda. 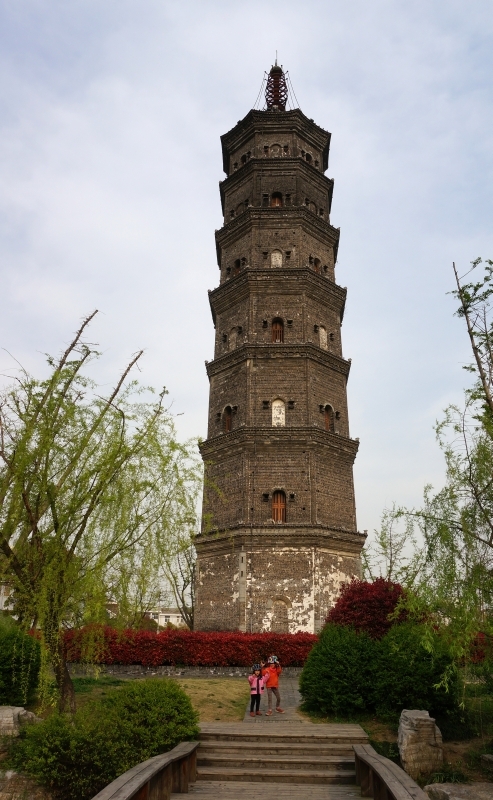 At first I don’t realise that this is one of the Gaoyou highlights I was reading about – the seven-storied Pagoda of the Pure Land Temple, built in the early 17th century. According to travellers’ reports from 2005, it was supposed to stand amidst a farmer’s field. The pagoda has been recently renovated and is now surrounded by a garden with a stream, some traditional-styled buildings and pavilions, and a wide square which is the meeting point for the neighbourhood in the early evenings. Old ladies gossip, kids ride their bikes and Bobby-cars, few young ladies make stretching exercises, elderly men slowly proceed with their evening stroll. A big group of people cluster around amateur musicians and a singer performing Chinese opera, and enthusiastically clap after each piece. Suddenly banging and crashing is heard from the crossroad – a car has collided with a tuck-tuck, causing its load of steel railings to tumble on the road. The crowd around us disperses and heads towards the new show of the evening. We are free to go and find our hotel. The hotel room welcomes us neither with golden wallpaper, nor with a round bed, but with a thick Bible, Chinese-English edition, laying right besides the hotel directory.